A second installment of patterned Paper Cuts as posted back in August. These are courtesy of a year 4 class and happened as another spontaneous gap filler for 15-20 minutes. The class had some small (maybe 15cm) coloured paper squares that seemed to be left over from something else. I think having larger paper would have given the students more design scope and room to navigate their scissors, but it is nice to find ways of using up left over odds and ends. A great lesson to teach symmetry and balance. Love the cut outs! Scissors and paper is a hit at any age! 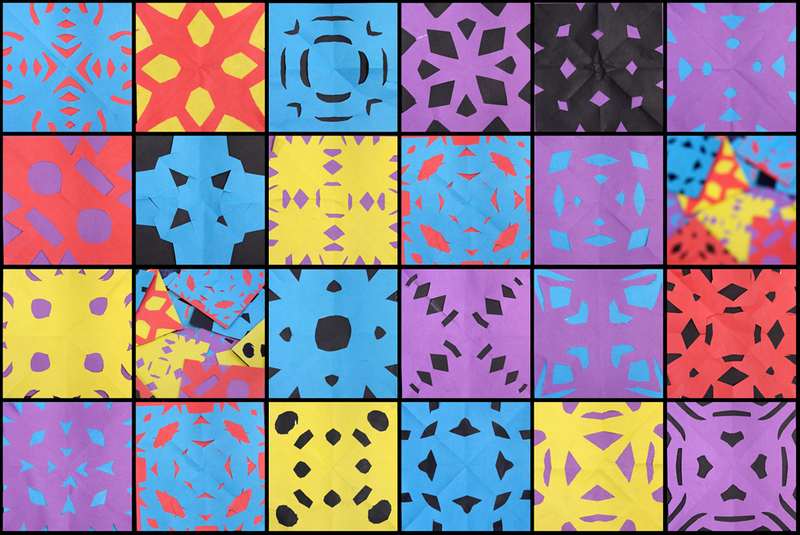 Here in the East Coast of the US my kids love to cut paper snowflakes! They look very much like the colored ones your students made! 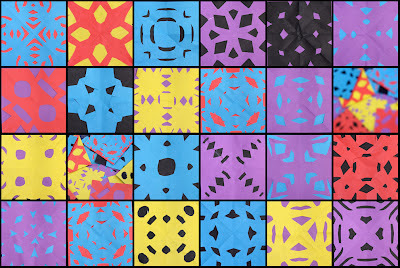 During our winter I saw some Kinder snowflakes at a school here too, they looked great! They also look great grouped together!